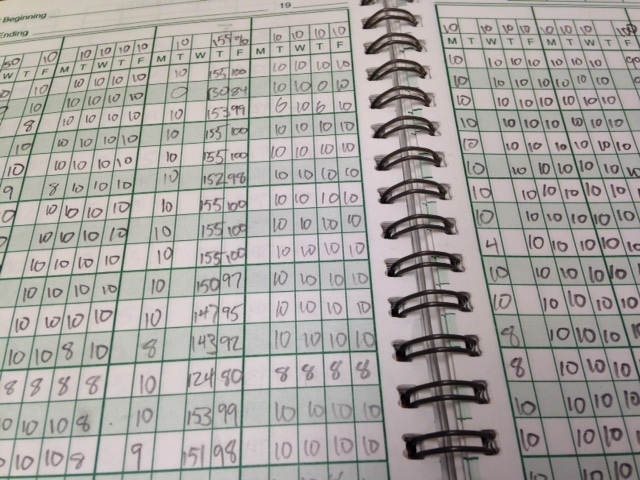 An image of a gradebook, borrowed with permission from flickr.com user David Mulder. I have been an educator in higher ed now, in some form or fashion, for fifteen years. One of the hardest parts of this job is still the grading, but it gets easier. I’ve made this grueling process more efficient and less dreaded over time. Let me tell you how to grade a math exam more efficiently and with less suffering. Before anything else happens, I’ve got to be in the right mindset. If I’m tired, I grade more harshly and miss more of the nuances of the students’ work. If I’m grumpy (which never happens, right?) then I’m not working in their best interest. In general, I’ve got to be in a pretty good mood. “Do no harm” must be my motto. Although a student’s performance ultimately determines his/her grade, my demeanor could impact a student’s grade, by extension their GPA, and by extension their career/future. I’ve boiled down a process to prep myself for getting ready to actually grade. I’ve already written the exam, but there’s more to it than that and we (educators) don’t simply sit and gut-check the grades into immortal red ink. Then, on my key, for each problem, I assign points at key steps in a process for that problem. When I have broken the points down alongside the work, I’ve actually converted the key into a basic, simple rubric. I grade one problem at a time. This helps me to be fair and remember the problem I’m grading most clearly. The graded problem is then cycled to the back of my stack, turning pages (as needed) to be ready to grade the next problem. I mark points off and then, in the right-hand margin corresponding to the problem, I tally the total points lost on that problem (parts included) and circle them. The missed points are tallied on the page when I need to fold the page over, in the lower right corner with a box around them. When I’ve graded the last problem of the test, I then tally all the points at the beginning, double-checking to ensure error free arithmetic. I will grade at least one problem, in a grading session, depending on the difficulty. For instance, I might grade all of the problems in a multiple choice or T/F section. But, on a difficult problem with pages of work, I might just grade one. Then, I sit it down for a while and focus on something else. When I come back, I’m not dreading another page quite as much as if I just tried to tackle the whole test. This process has come to save me tons of time. Notice that I circle and box points. I don’t want to make silly arithmetic errors. This makes my students happier and saves me time. All in all, I’m offering this content so that grading becomes less than the daunting task you were expecting. While I still dislike grading, I dislike it less than I disliked it before. Good luck as you grade your exams! ← You Think You Want to Earn a PhD?